This week’s plant for #WildEdibleWednesday is Stellaria media, or Common Chickweed. A member of the carnation family, Chickweed is another great example of a common lawn weed that’s way, way more valuable and useful than the grass that grows around it. It grows almost everywhere, and is one of the rockstars of the edible and medicinal plant world. The name comes from the fact that all manner of poultry absolutely love it, and chickens will seek it out above all other wild plants. Chickweed is one of the hardiest and most common plants on earth. Native to northern Europe, it has naturalized on every continent – even Antarctica. It thrives in the humid tropical regions of central and south America, the scrublands of Africa and India, meadows on remote Pacific islands, and inside the Arctic circle. It can adapt to nearly any conditions as long as it’s not too dry. However, it is most often found in cool, moist areas of part shade. In hot climates, it prefers full shade, or is only active in the spring and fall months. In Georgia, this means that it’s most easily sourced right now, that is, in early spring before the summer sun scorches it. Look for it in open woods, pastures, fields, roadsides, abandoned construction sites, and of course, lawns. Chickweed is an annual herbaceous forb. It dies off every year and re-grows from last year’s seeds. In ideal conditions, it grows in thick, tangled mats on the ground, choking out other vegetation (especially lawn grass). It is a small plant, rarely growing more than 6” tall, although its weak stems will sometimes trail to 18”. Its leaves are up to an inch long but usually smaller, and its tiny white flowers are smaller than a pinky fingernail. It has a unique habit: at night or in bad weather, the leaves and flowers fold up and the plant “sleeps.” This can be valuable to woodsmen, as the leaves are triggered by barometric pressure changes, and will fold before it actually starts to rain, kind of like an early warning system to seek shelter. It has no deadly mimics, but does resemble some toxic plants such as Drymaria. There are three ways to positively identify it: One is to break the stems – if it has milky white sap, it’s not chickweed. Let it be. Another is to check the hairs on the stems. Mimics have hairy projections all the way around the stem, chickweed has hairs on only one side of the stem that alternate with every leaf. And finally, the sheath of the stem separates easily from the core – gently twist and pull, and the two will come apart. Chickweed is a great edible. Eaten raw, it’s probably one of the best-tasting wild greens in our area. It’s got a mild, delicate flavor that’s very slightly sweet. It’s an excellent addition to a salad, or as a salad in its own right. It also works well in sandwiches or wraps as a replacement for bean or alfalfa sprouts, if you’re into that kind of thing. It’s good cooked as well, but keep in mind that its tiny leaves don’t need much cooking time. If you’re using it in soups or stews, add it in the last five minutes of cooking. It can be used in any recipe that calls for cooked spinach. It’s highly nutritious as well – Chickweed is loaded with vitamins C, A, and K, calcium, magnesium, riboflavin, zinc, selenium, thiamin, and copper. It’s also high in fiber and is a natural digestive stimulant, so if you’re having trouble getting things moving, chickweed might be the ticket. Which leads to chickweed as a medicinal herb. Chickweed is almost on the same level as Plantain when it comes to medicinal uses. Externally, a poultice of the leaves can be used in the same manner as plantain – for cuts, bruises, scrapes, burns, and insect stings. 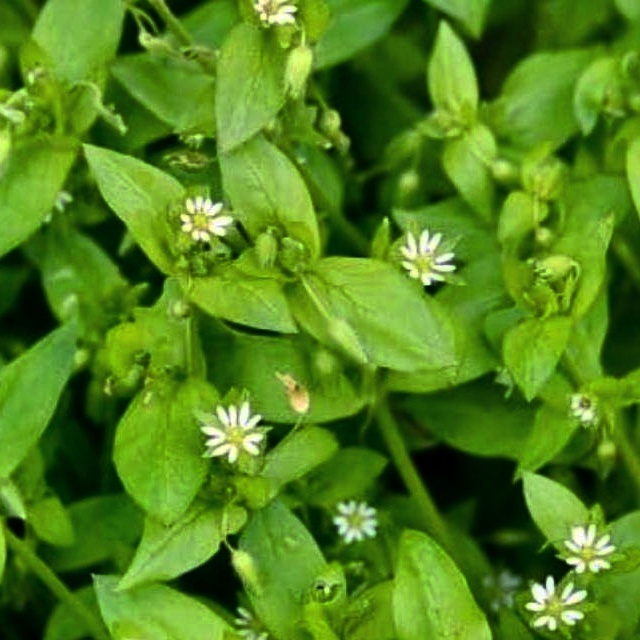 Chickweed poultice is also useful for helping calm down skin inflammations ranging from acne to eczema to psoriasis. It has a cooling effect which helps soothe irritated skin. A salve made from the plant is even better. Internally, chickweed is an anti-inflammatory, analgesic, diuretic, expectorant, antihistamine, and bronchodilator. A tea or infusion is useful for treating chronic inflammatory pain associated with rheumatism or arthritis. It’s also useful for relieving menstrual pain. As a diuretic, it’s been traditionally used as a flush for kidney and bladder health. As an expectorant and bronchodilator, it works well for treating mild coughs and colds. Most interestingly, it can serve as an antihistamine for relieving allergy symptoms… keep that one in mind in a few weeks! Chickweed is just another example of how the most valuable plants in your yard are probably the ones you’ve been trying to kill. Along with plantain, oxalis, lamb’s ear, burdock, dandelion, and many more, there’s a whole salad bar and pharmacy right outside your front door. Just remember when foraging to make sure that wherever you’re gathering from hasn’t been sprayed with pesticides or herbicides. Organophosphate poisoning is no joke. In a few weeks once everything greens up a little more, we’d like to propose the Yard Salad Challenge: forage a salad from your yard (or nearby area), post a photo or video, and tag us in it. Our favorite one will get a social media shout-out and win a prize! More details to come. In the meantime, start foraging!